Today was Day #3 of Chocolate and Coconut Theme Week. I was delighted to find three different coconut bars at a new shop (SweetE Organic) in Marin County, while on a Bay Walk recently. I'm always happy to see more options for organic, fair trade and gluten-free treats. 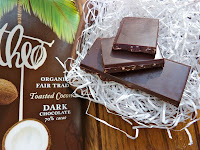 Today's chocolate was a Toasted Coconut dark chocolate bar from Theo Chocolate (Seattle, WA). 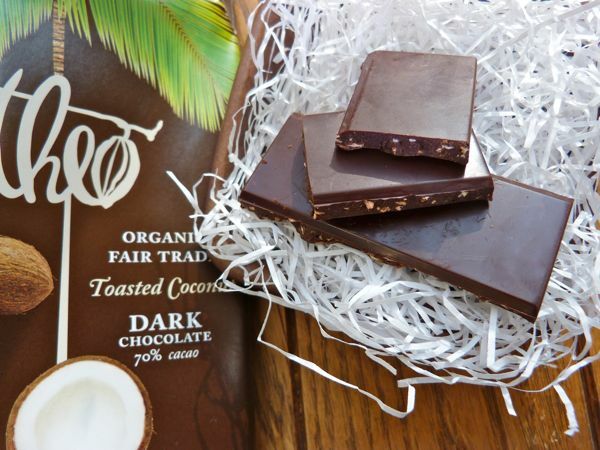 Theo helped pioneer organic, fair trade, bean-to-bar chocolate making in the U.S. and they offer a line of different bars with inclusions (like coconut, or cacao nibs), made with beans from Peru, Ecuador and the Democratic Republic of Congo. And, if you'd like to know more about their story and making chocolate -- and you live in the Seattle area -- you can sign up for Theo Chocolate University* courses. *Note: Chocolate Universities are popping up all over, a sign of renewed, and increased interest in chocolate making and fine chocolate, over the past decade. Related sites include Chocolate University Online; the Hershey's sponsored All Chocolate site; and Askinosie Chocolate University, (.org) designed to benefit children near the Askinosie factory. I liked today's Toasted Coconut, dark (70% cacao) bar, but it had a slightly bitter aftertaste. The small pieces of toasted coconut in the bar were very pleasing (almost sesame seed-like in size, texture and flavor), and the bar was not heavily sweetened (which I generally prefer). Not wanting to add more sweetener (although I contemplated trying a bit of coconut palm sugar), I neutralized the "bitter" taste by eating this chocolate with a tiny pinch of sea salt -- and imagined myself on a sunny tropical white sand beach with salty sea air and coconut trees (instead of sitting in front of a digital hearth (laptop) on a cold winter day). Then, all was well. The tongue is like a painter's palette -- with our "colors" being our taste receptors for sweet, salty, sour, bitter, umami, etc. The right mixture of colors and textures will create a painting that is pleasing to the eye; but just as preferences for art will vary, so will tastes in food, drink and chocolate. Most people are sensitive to bitter flavors. Bitter substances such as tannins (in red wine), or hops (in beer), or certain compounds in chocolate, help balance out sweet or fruity flavors, or round out a tasting experience. Others, particularly "super tasters" may not care for bitter flavors in general. Does this help explain why some people don't like dark chocolate? Perhaps. But, I've had 90%+ cacao bars that were surprisingly mellow; so the cacao beans, and how beans are fermented, roasted and turned into chocolate play a role in the final product as well. What one eats before or with chocolate can also affect the tasting experience. A garlic pasta, or strong cheese, can shift flavors of other foods, as could a wine. In this case, I sampled this bar with only water -- and, later, salt.